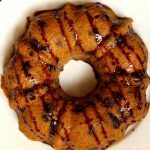 Instant Pot Pumpkin Chocolate Chip Breakfast Cake–a dense and moist, almost bread pudding-like cake with the popular flavor combo of pumpkin spice and chocolate. This delicious cake is the perfect choice for a fall treat, or any time of year that pumpkin craving strikes! Good morning! 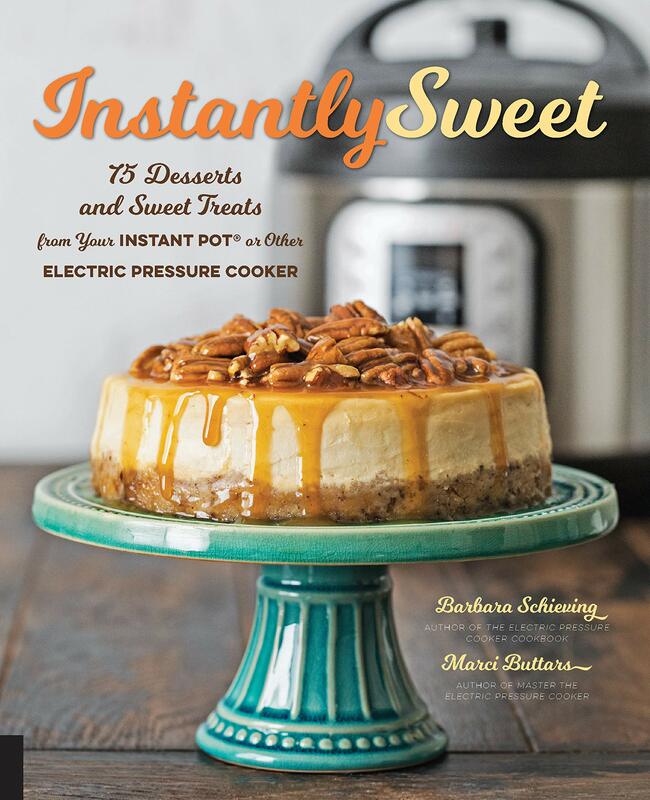 My Instant Pot pals Marci Buttars and Barbara Schieving teamed up to create an Instant Pot cookbook with all sweet treats! This is totally up my alley. If you know me you know I love desserts. It’s all I think about some days. The new cookbook, Instantly Sweet*, shows you how to cook quick and easy desserts and sweet treats in your Instant Pot or other electric pressure cooker. Haven’t tried at making a dessert in your Instant Pot? The Instant Pot is proven to be fast, safe, and more versatile than you’d expect. Don’t those all just sound wonderful? And guess what?! I am actually giving away a copy of Instantly Sweet to one of my readers! Make sure to enter below or just get your copy now from Amazon*. Today I’m going to be sharing with you one of the recipes from Instantly Sweet*. I tried out the pumpkin chocolate chip breakfast cake on page 34. It is really dense and moist. The consistency almost reminded me of bread pudding. It’s a little healthier than most cakes because it has whole wheat flour, less sugar and Greek yogurt. My family thought it was to die for. And I kept sneaking bites of it all throughout the day. You can eat it with a fork or eat it like a slice of bread. However you eat it, you’ll be loving it! 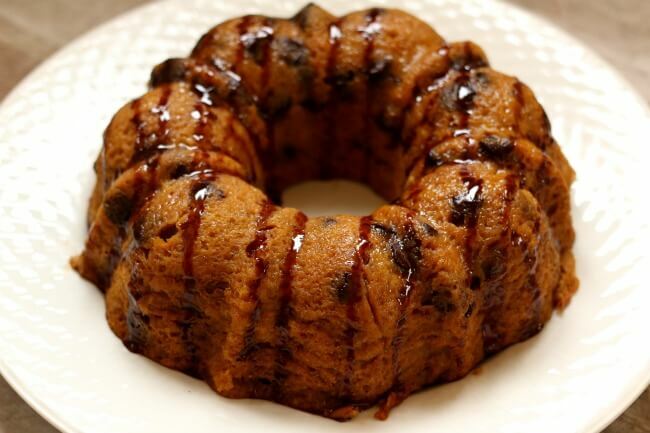 To make Instant Pot Pumpkin Chocolate Chip Breakfast Cake I used my 6 quart Instant Pot Duo 60 7 in 1*. I love this Instant Pot because it has the yogurt making function which I use almost weekly. It has two pressure settings (high and low), and there are also little slots in the handles so that you can rest the lid there instead of putting it down on your counter-top. 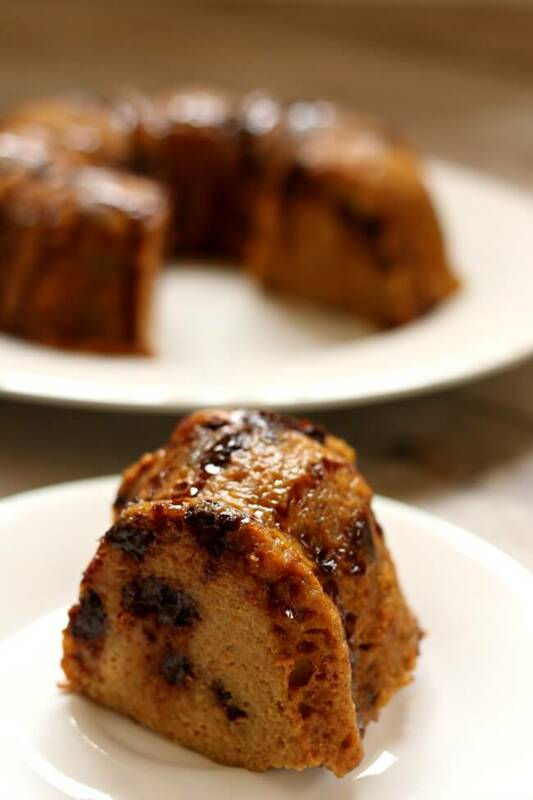 A dense and moist, almost bread pudding-like cake with the popular flavor combo of pumpkin spice and chocolate. This delicious cake is the perfect choice for a fall treat, or any time of year that pumpkin craving strikes! Spray a half-size Bundt pan* with nonstick cooking spray. In a medium bowl, whisk together the flour, baking powder, cinnamon, pumpkin pie spice, and salt. Set aside. In a large bowl, whisk together the eggs and brown sugar until smooth. Add the butter, yogurt, pumpkin, and vanilla and whisk until smooth. Add the dry ingredients and whisk just until blended. Fold in the chocolate chips. Spoon the batter into the prepared pan. Pour 1 cup (235 ml) of water into the pressure cooking pot and place a trivet* in the bottom. Carefully center the filled pan on a sling and lower the pan into the cooking pot. Lock the lid in place and turn the pressure release valve to the Sealed position. Select High Pressure and 25 minutes cook time. When the cook time ends, turn off the pressure cooker. Let the pressure release naturally for 10 minutes, and finish with a quick pressure release. When the valve drops, carefully remove the lid. Use the sling to transfer the pan to a wire rack. Cool for 5 minutes. Gently loosen the edges, remove the cake from the pan, and cool for 5-10 minutes on a wire rack. Serve warm. I used this half size bundt cake pan*. Recipe is from Instantly Sweet* by Barbara Schieving and Marci Buttars. 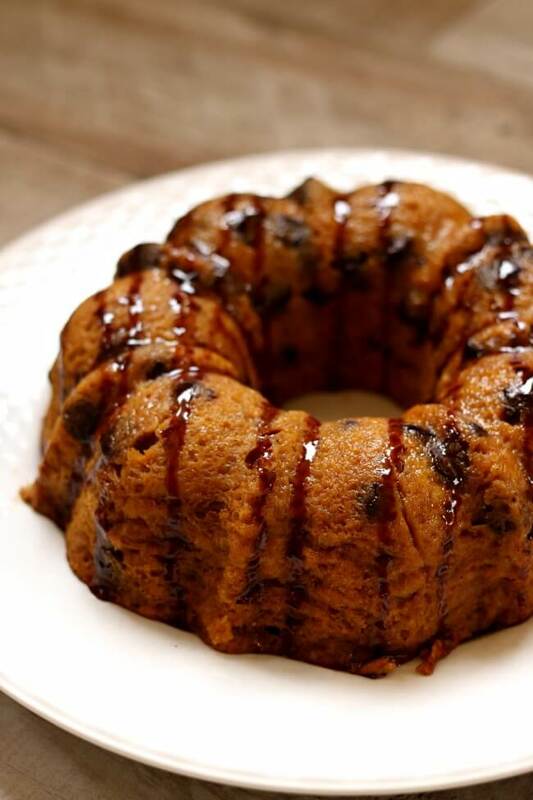 Like this recipe for Instant Pot Pumpkin Chocolate Chip Breakfast Cake? Get all my new recipes delivered to your email inbox by signing up below. Waving from Canada. Love your recipes, videos and especially notating the tools you use from amazon. Thank you. 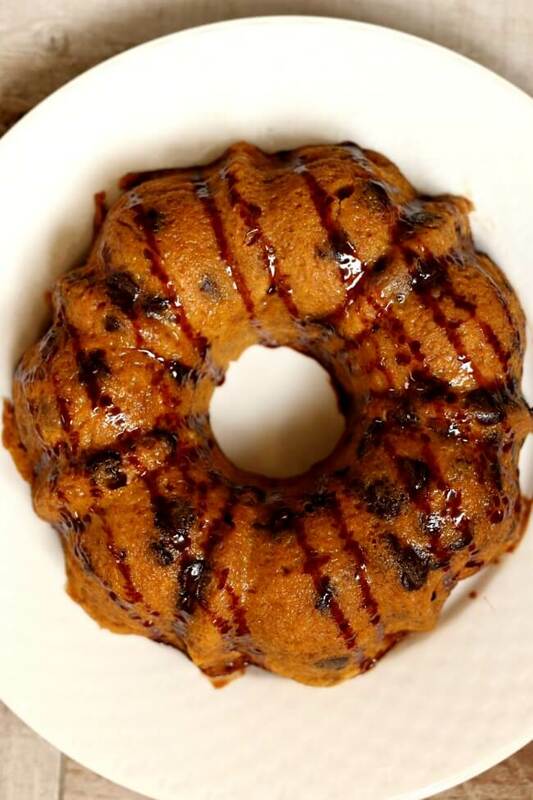 I made this chocolate chip pumpkin breakfast cake, used a 6 quart instant pot and the same Bundt Pan. I substituted sour cream for yogurt, and used white cake flour with whole wheat flour instead of the pastry flour. Mine came out really moist, almost too moist! Can I cover the pan with foil? It tasted great, just way too wet! Oh, yes you can cover with foil. That is a good idea! Good old Salt Lake City, Utah! I don’t have one favorite, but love trying all your recipes! I love doing baked potatoes and hard boiled eggs in instant pot, so much fun! They turn out great! I love your cite and emails, thanks for doing this! Waving from PA. Tried the pumpkin cake this weekend, a super moist, delicious cake! A big hit!!!! I’m originally from Midland, Michigan, but have lived in Nashville, Tennessee for 27 years (I’m moving back to Midland in three years…can’t wait!). I love your recipes. You are my go-to for pressure cooker recipes. Your macaroni and cheese recipe is excellent. My sons love it. I made the cheeseburger mac and cheese for a meal we put together for my son’s football team and the boys who ate it said it was their favorite of all the dishes we had on offer. Keep up the great work! I’m from California. So far our favorite IP recipe is Apple Butter pork chops, but we are still new! I am new to the IP but am getting good at making hard boiled eggs. I appreciate have IP recipes to follow. They look really good. I like how you use normal things that I have in my house and seldom have to go to the store to find the things I don’t have. I haven’t had my instant pot for too long but boiled eggs were a favorite. And lots of chicken to shred for recipes. I’m from Minnesota. I like making boiled eggs and chicken for shredding. I live in South Carolina. I just got an electric pressure cooker and have only made boiled eggs, chicken broth, and now am making beef broth. I love the boiled eggs! Looking forward to new recipes. Thanks! I keep meaning to open the instant pot that I got last Christmas but never seem to find a recipe I wanted to make in it. This book would probably do the trick! Don’t eat lots of sweets. But will be trying your steamed carrot cake in the instant pot. Would love to win the cookbook. From Florida. Love making pasta dishes in the Instant Pot. Hello, my name is Wendy and I’m from Kentucky. I’m an Instant Pot beginner, so I haven’t really made much in my Instant Pot yet. I’ve made taco pasta, steamed vegetables, and hard-boiled eggs. I look forward to expanding my Instant Pot knowledge and making a variety of recipes. I am writing from Idaho. I love to make soups in my Instant Pot. I am from Richmond, VA. I am new to instant pot and havent tried any of your recipes yet but am planning to soon! I’m from California. 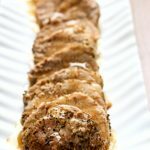 I love the 3-ingredient Chicken and Gravy. It reminds me of Thanksgiving. Hi from AZ! I love making pasta in my Instant Pot. This recipe sounds amazing! So far everything I’ve made in the IP has been delicious, but quick soups are my favorite. Looking forward to more pumpkin recipes too! I love making hard boiled eggs in my Instant Pot. Your macaroni & cheese recipe is awesome, & we enjoyed the BEST corned beef & cabbage ever! Look forward to your email every day. Thank you! New to IP and love it so far. Thanks for the hints and recipes! That looks so yummy. I love your website it has saved my life using my pressure cooker. I’m writing you this comment from the state of South Carolina. My electric pressure cooker is a Cuisinart (not an Instant Pot) , and my favorite thing to make in it is refried beans that start with dried beans. I have yet to try making a dessert-type thing in it. 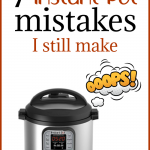 I am getting an instapot and am so excited to get all of these recipes & tips. I live in AZ and we are busy getting ready to move from the city onto 2 acres a couple of hours north of here. The IP has been a great time saver for me, but my husband has been missing the baking part of my cooking! Recipes like these will definitely put a smile back on his face. Looking forward to using my IP to make more sweet treats, especially anything with pumpkin and cheesecakes. I’m in New England and my family loves your lasagna soup recipe. Deatsville AL – Love ribs and pot roast in the instant pot – saves so much time and is absolutely yummy! I’m here from Kentucky. I am new at the IP recipes so no favorite yet. Grand Rapids, Michigan and I love that I can make hard boiled eggs in my instant pot!! Thank you! I don’t have an instant pot or the space or money. I love, love, pumpkin. Could you please print the same recipe for slow cookers? Your website is 364 days of crock pot and I was hoping you always have both instant and slow pot recipes. Please include desserts for a slow cooker. In a large bowl, whisk together the eggs and brown sugar until smooth. Add the butter, yogurt, pumpkin, and vanilla and whisk until smooth. Add the dry ingredients and whisk just until blended. Fold in the chocolate chips. Spoon the batter into a greased 6 quart slow cooker. Cover the slow cooker and cook on HIGH for 3-4 hours. Turn off the slow cooker and let it sit for 10 minutes. Serve warm. I’m wondering what the drizzle on top of the bundt cake is. There’s no mention of it in the recipe nor in this thread anywhere. Love you soups. The Tortellini spinach and chicken soup is my favorite. Can’t wait to try your Pumpkin cake. I look forward to your new recipes and info each Tuesday. 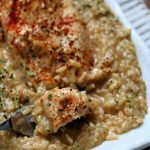 I’m from New Jersey and I like just about everything that comes out of my instant pot! I’m wondering if anyone has made this cake using Gluten free flour. Would love to try it!! I’m so excited for this recipe. My family is nuts for pumpkin all year round. It looks delicious! Can’t wait to try it. Chiming in from Mesquite, TX! You know what I really love? 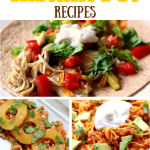 That you awesome IP ladies work together to provide us with these amazing recipes ….. not all IP bloggers are that way, and you and Barbara are always my go to and who I send all my IP newbies to. Thanks for all you do! The cookbook sounds amazing and the cake looks delicious. I’m from Canton, Ga. I love everything that I do in my IP (and Cuisinart and Elite). 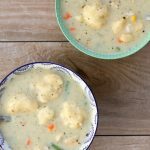 My most favorite recipe to date is the Loaded Potato Soup. I recently cooked pumpkin (a lot of pumpkin) that I traditionally do in the oven. The time saving was tremendous not to mention the amount of power that was saved as well. I’m from the east coast but I live on the west coast now, and my favorite instant pot recipe is fried rice. Thanks for the giveaway! Thanks for the great review! Love your pictures of the cake. Hugs! I can’t wit to try this. Any substitutions for wheat or white flour? Almond- coconut – spelt? I’m really unsure on this. I don’t use these other types of flour so I’m not sure how it would turn out. Kansas City. Your Tuscan Tortellini Soup is our favorite. We had 3 meals out of it. Every time we both commented about good it was. Love anything pumpkin. Can’t wait to try this new recipe. Thank you for your blog and videos. I hail from CNY,Syracuse,NY to be exact.My fave recipe for IP is the roast my “step sister” makes…..fill’s my belly every time!!!! This cake looks so yummy! We love making chilli in our IP. No splashing all over the place as it simmers and it’s finished in no time. Planning on making this in a coupla days. Is it really five eggs? yes! I thought it was a lot too. You’re awesome Karen! Thank you so much for such a thoughtful review. I’m so glad you liked it. My kids have been begging me to make that one for a couple weeks now 🙂 . Sorry kids, you’ve got to taste test other recipes for mommy, haha! It’s just their lot in life! haha! I currently live in Cibolo, TX, but have lived all over and grew up in Spanish Fork, UT. 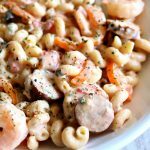 I think my favorite pressure cooker recipe is Mac n cheese or pasta. Really anything dinner related as well that I can put together quickly. Soup is always good too. I’m on the 365 Days of Crockpot blog. I’ve only had my instant pot a few weeks and am still learning how to make the most of it. So far I use it to make rice mostly. I’m from central Arkansas. Love making hard boiled eggs, meatloaf and any soup! Texas!! I love cheesecake made in my instant pot. If you use AP unbleached flour how much should you use? Thanks! I would use the same amount. I think roast or spaghetti is my favorite at the moment, but I’m sure it will change as I try new recipes!! Living in Kansas, but from NEBRASKA! Michigan where I love making soup and hard boiled eggs in my IP! I’m from Utah. My current favorite things to cook in my Instant Pot are either baked potatoes or hard boiled eggs.